Extreme Carpet Cleaning offers complete drapery cleaning services for customers drapes in Towson and the Baltimore, MD Area. Extreme Carpet can safely and effectively clean your drapery with our state of the art truck mounted system of cleaning. 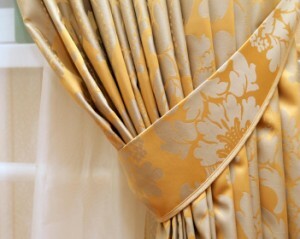 Our hydro kinetic method allows us to properly clean your drapes in-house while on the rod, saving you time and money. Save the headache and allow us to do it while in the home. We will inspect fabrics before cleaning to insure the proper method is used, from solvent dry-cleaning to steam cleaning and shampooing, each is different. Prepare and inspect the surrounding areas, floors, and furnishings before beginning and processes. Pre-vacuum the entire drapery front, back, top and bottom with our hepa-vacuum which is exhausted outside to our truck mounted machine. This will remove much of the trapped dust, cobwebs and any other debris before beginning any solution cleanings. We will then pretreat drapery with the required cleaning solution to loosen any soils from within such as smoke, allergens, dust-mites, aerosol sprays, cooking grease, and pollen. Then using our hydro kinetic method of cleaning extract any ground-in soils or contaminants from within the fabric with minimal water leaving your drapes fresh and clean and almost dry to the touch. Call (410) 666-6600 to learn more about our Baltimore Drapery Cleaning Services. Extreme Carpet Cleanings’ thorough drapery cleaning service in Baltimore can make a positive difference for for customers drapes of any size. Contact us today at (410) 666-6600 for a drapery cleaning estimate.